Scoliosis is the #1 spinal disorder afflicting school-aged children and is one of the more common disorders of the spine in the population today. 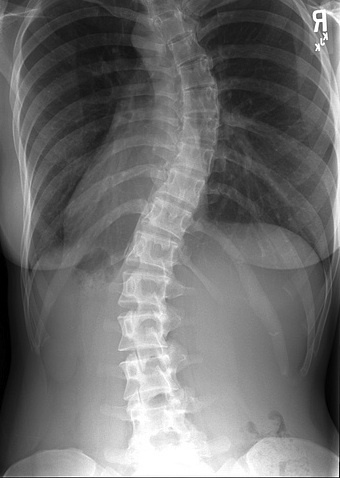 Scoliosis is said to be prevalent in about 4.5% or 13.5 million people in the United States. Scoliosis is defined as an abnormal lateral or side to side, three-dimensional deformity of the normal straight spine measuring 10 degrees or more, using the Cobb angle method of measurement. The spinal column creates a side to side “S” shaped curvature and vertebral rotation occurs causing the “rib hump” often viewed from behind. Scoliosis is one of the oldest existing deformities. Hippocrates invented a treatment for scoliosis between 460-377 BC. He wrote, “There are many varieties of curvature of the spine even in persons who are in good health; for it takes place from natural conformation and from habit.” Galen first used the term scoliosis in the second century. Derived from the Greek word Skol, which means “twists and curves” (Lakshmanan, Peehal, and Ahuja 2008). However its cause and mechanism for progression are still not completely understood.